So as a blogger I am incredibly lucky to get invited to some amazing events, and in turn meet some amazing people. A few months ago, in the spring, I was able to attend The Grooming Rooms during Men’s London Fashion Week . The Grooming Rooms itself is an incredible event held at The Century Club in Soho where bloggers and influencers get to meet brands and talk to their reps and PR’s directly, as well as try out some of their products! It is here that I met the lovely Natasha who is a consultant for Minerva Labs, the company behind Gold Collagen. We got chatting about our day so far, it was still very early, 10am or so – which isn’t actually very early for me, but in the world of Fashion Week being seen before midday in a presentable state is a god send when you’ve been out partying! Anyway I made a remark about how I felt extremely tired, and my skin was so dry – probably due to not taking all of last night’s make up off – GUILTY please don’t judge! Natasha started to tell me about Active Gold Collagen, a daily liquid supplement that has been formulated and undergone trials to promote younger looking skin, contribute(d) to reduced fatigue, as well as support healthy hair and nails.It also helps relieve joint pains and tired muscles after exercise.- well it certainly caught my attention! Natasha informed me of the benefits of Collagen, providing structural support for the skin and other connective tissues such as your joints, ligaments and muscles. It helps smooth and plump skin, promoting a younger-looking appearance. 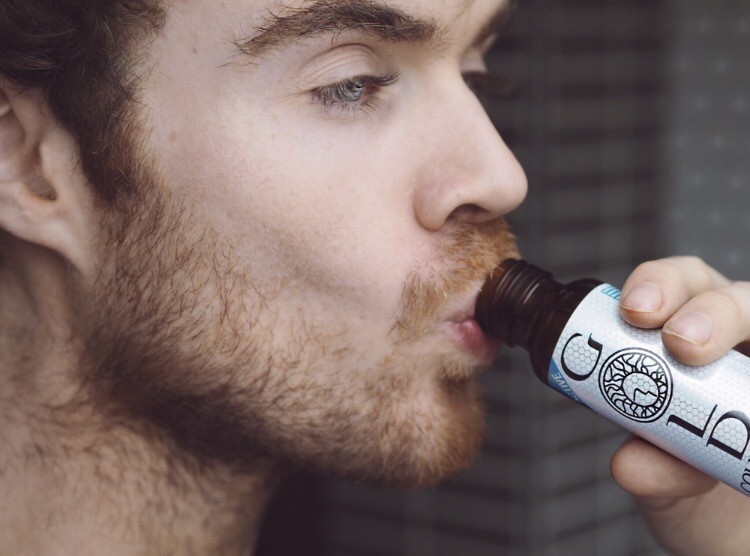 Well, I certainly was intrigued, it sounded as if it was an Elixir of life in a bottle! Natasha sent me a month supply to try for myself and see if I noticed any difference! Now I must admit, I was extremely sceptical – how on earth was a drink the size of a double shot of spirits daily going to make me look and feel any different… Challenge Accepted! 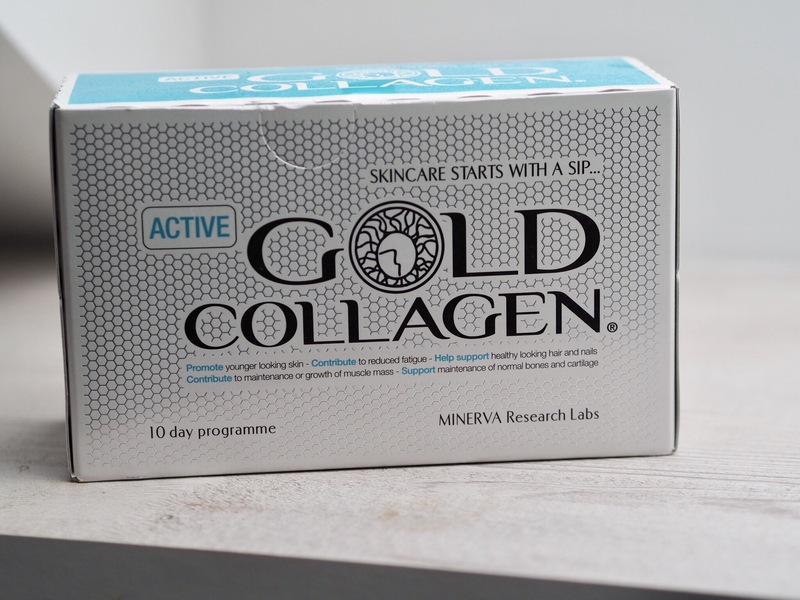 So it might be worth me telling you what Active Gold Collagen actually is, well it’s a liquid beauty supplement, designed to help boost the levels of collagen, elastin and hydration in your skin. As mentioned your daily dose is about the same size as a double shot – the fact I can give you relatable measurements based around alcohol consumption probably should act as reasoning for my needing this product- tasting of what I can only describe as a delicious blend of sharp apple mixed with a bit of honey. 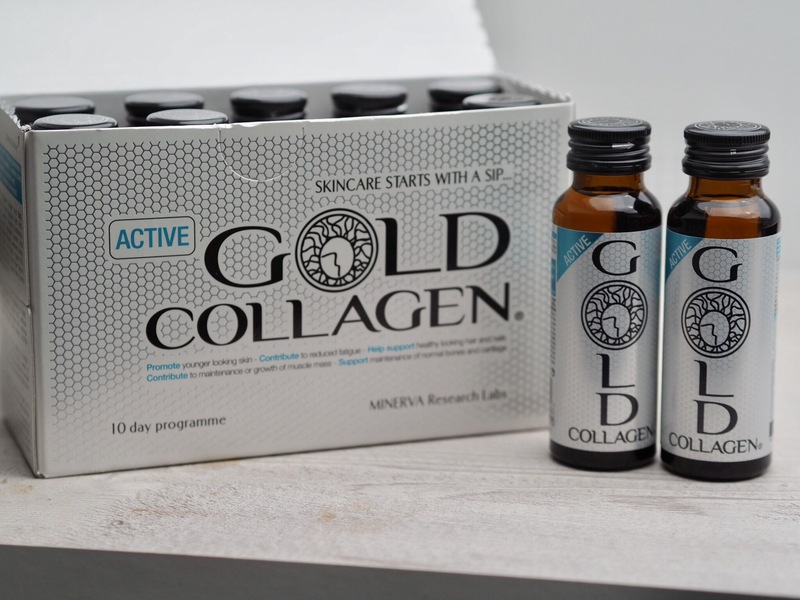 Active Gold Collagen products are all formulated with the highest quality collagen which is absorbed into your skin to formulate new building blocks of cells, resulting in the plumped up skin – without needing any needles! The benefit of it being a liquid means that it can be actively absorbed into the body working on all of your body skin, other thana lot of fancy creams that have molecules too large to pass through the epidermis – if only I had learnt this in GCSE Biology instead of facts relating the osmosis of potatoe skins, maybe my skin would’ve fared better in life! So, the big question of did it work…. well as I started the treatment (not sure if you call it a treatment, but the course of products) and I didn’t notice any immediate changes, not too sure what I was expecting, take one shot and have some grand reveal like Anne Hathaway in the Princess Diaries… however after a few days I certainly felt less fatigued, which is great as I’m an early riser so also found a 3pm flag time! As the course continued my skin began to feel softer, smoother and I was finding I didn’t need to wear as much makeup in the day, which was great! By the end of the course I was hooked – taking the shot ice cold first thing in the morning from the fridge kick starting my day! Lucky guy Jamie firstly to be able to attend MLFW. Secondly to get test a great product.